In 2010 the Indian Space Research Organisation (ISRO) began a mission to send a spacecraft to orbit Mars – the Mars Orbiter Mission (MOM). Three years later they launched the craft and finally, on 24th September 2014 it reached its destination. The spacecraft’s primary objective is to test and develop the necessary technologies needed for interplanetary space travel - a technology which will allow India to plan future missions through the solar system and beyond. Its secondary objective, though, is scientific research. As the craft orbits the planet it will be collecting data about the planet’s atmosphere and surface. The journey to Mars, though relatively short compared to a journey to other planets, is a complicated one; out of the 23 missions which have been launched to orbit Mars, only 10 have been fully successful. For India, this maiden voyage means the chance to explore the red planet whilst also developing their technological know-how. The whole mission has cost ISRO about $70 million - making it the cheapest vessel to enter Mars’ orbit since exploration of the planet began! For comparison, NASA had to pay a similar amount per seat to fly their own astronauts to the International Space Station in a Russian spacecraft. This is an incredible feat for technology and may lead to reduced costs for future missions to Mars. Mars is the outermost of the four rocky planets in our Solar System, and is also Earth’s neighbour. Despite having similar rocky compositions these two planets couldn’t be more different. The oceans, flora and fauna which are so prevalent on Earth are completely absent on Mars, and yet the two planets’ orbits are separated by a mere 54.6 million kilometres – a galactic stone’s throw away. Astronomers and planetary scientists have been studying the planet for a while now, and yet there is still so much we cannot decipher about the planet and its history. 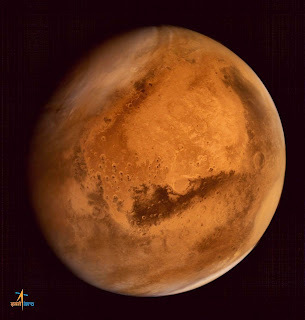 MOM is now one of many satellites orbiting Mars which are currently operational, and through the five finely-tuned instruments on board, researchers at ISRO can hope to discover more about it. The Mars Colour Camera is the optical imager for the orbiter, taking pictures of Mars’ surface as it encircles the planet. It will also be taking images of Mars’ moons - Phobos and Deimos. The information gathered from the other instruments will rely heavily on the images taken by the MCC as it will help to place the data when mapping the planet. There are some similarities between the Earth and Mars, too. Like the Earth, Mars’ axis lies at an angle, and so every Martian year (around 686 days) the planet has four seasons. It also has a north and south magnetic pole though researchers have found only the faintest traces of a magnetic field . We know Mars has polar ice caps at these poles - in fact these ice caps are viewable from ground-based telescopes on Earth. Measurements made by other rovers and orbiter missions have revealed to us that some of the ice at Mars' poles is actually frozen carbon dioxide, and some is frozen water. Furthermore, the rock and soil analysis indicate there may have been water present in the past, and there are a number geological structures which point to the same conclusion. This is hugely exciting, as water is the basis for life as we understand it. But according to a presentation on NASA’s MAVEN mission a lot of the water and early atmosphere on Mars has disappeared. So where has it all gone? The Lyman Alpha Photometer (LAP) is built to detect the hydrogen/deuterium ratio in Mars’ upper atmosphere to help answer this question. Now we have an extensive mapping of the surface of Mars, we can see striking differences in its northern and southern hemispheres. The geology of the north consists largely of low lying smooth planes, most likely to have been caused by lava flows, while the south has high rocky outcrops and deep impact craters. This tells us that the southern half of Mars hasn’t seen much geological activity for a much longer time than the northern half, since the craters would have originally been created quite evenly across the planet. Therefore something in the north must have wiped away the craters and impact features. But what? It's possible that mantle and crust movements are at the cause of this, however we do not have a complete understanding of how these features work on Earth, never mind on other planets! Thanks to the Mars Colour Camera (MCC), ISRO will be able to collect even more data about the planet surface. It's able to capture features too large to be seen from the surface and may point us in the right direction. MOM also has a Thermal Infrared Imaging Spectrometer (TIS) on board which will be able to detect radioactivity in rock and soil, and also will be functional when the satellite passes over the night side of the planet. The Lyman Alpha Photometer (LAP) and Methane Sensor for Mars (MSM) are used to measure the abundances of hydrogen and deuterium, and methane respectively. Knowing the methane content of the planets atmosphere and exosphere is crucial to understanding what processes might be going on underneath the surface. Due to Mars’ lack of magnetic field, methane should be easily destroyed by the solar radiation, however it is detected all over the planet. Using MSM, ISRO can map the variations of methane across Mars and see exactly where it is coming from, giving us insight into this unanswered query. The Mars Exospheric Neutral Composition Analyser (MENCA) is the fifth instrument on board the orbiter, and is able to detect any particles which may fly into it to determine the composition of Mars’ exosphere. This way MOM has a comprehensive set of detectors able to identify elements from the surface of Mars, way up to the limits of its exosphere (80,000 km above the surface). ISRO will then use all this data collected by the instruments to try and find out some more about the planet's history. Why isn’t the Earth more like Mars? Was there ever life on Mars, and is it there now? MOM, while not solely intended for the purpose of answering these questions, can certainly help us find clues. In six months, MOM will have completed its mission mission, by which time mountains of data will, hopefully, reveal a little more about Mars. Step-by-step, our red neighbour is becoming less alien to us. This article was written by our Physics Editor Grace Mason-Jarrett. Bibring, J. P., et al. (2004). Perennial water ice identified in the south polar cap of Mars. Nature , 428(6983), 627-630. Acuna, M. H., et al. (1998). Magnetic field and plasma observations at Mars: Initial results of the Mars Global Surveyor mission. Science , 279(5357), 1676-1680.